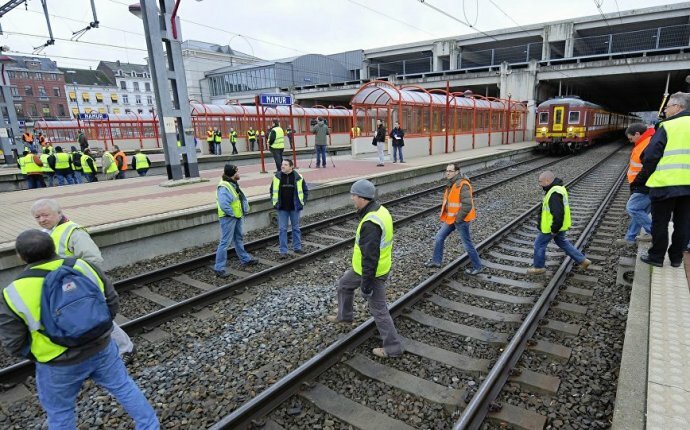 While trains ground to a halt in Francophone parts of the country in a dispute over a reduction in overtime pay, 50-65% of trains were running in Flanders, exposing the differences between the north and the less affluent, French-speaking south, where the unions are more powerful. The different approach to industrial action was reflected by the decision of two Francophone unions to reject a deal with the justice ministry to end a five-week prison-officers’ strike. Belgium’s justice minister, Koen Geens, promised on Monday to hire more prison officers, a concession that allowed him to reach an agreement with four out of six of the country’s prison-officers’ unions – the three Flemish unions and one liberal Francophone group. 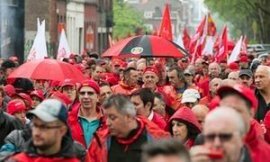 Meanwhile, several thousand workers, including teachers, train drivers and firefighters, marched in Brussels, to protest against cuts to public services. Some were waving placards that read “fighting for our rights”. Trade unions have also been protesting against attempts to change Belgium’s labour laws. The government wants to make it easier for employers to hire part-time workers on short-term contracts, but union critics say this will lead to the introduction of zero-hour contracts in Belgium. The strikes have provoked a furious backlash from student unions, who fear disruption during exam season. “There are few schools that are functioning normally today, ” Pascal Chardome, an official with the CGSP union, told Belgian TV channel RTBF. Most schools were reported to be open, although pupils were likely to have been affected by transport strikes. The FGTB union, which claims 1.5 million members, has called a general strike for 24 June to protest against government policies of “austerity and labour-market flexibility”. Separately, judges have announced rolling strikes during the first week in June to protest against cuts to legal budgets.